Hurricane Florence is currently inundating the coast of the Carolinas, with strong winds, heavy rain and a formidable storm surge. As it progresses inland, the system is likely to bank northeast, potentially impacting our region late Sunday/early next week. It’s expected to downgrade to a tropical depression before coming our way, but steady rains last week mean flooding from the resulting rainfall could be an issue in our area. 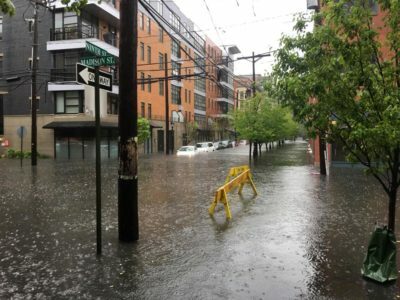 Hoboken officials have taken proactive measures to mitigate any impact from the storm’s aftermath, declaring certain flood-prone areas “NO PARKING” zones. However, the City has been unclear as to whether or not those zones will be enforced by towing, or if it’s simply a park-at-your-own-risk warning. There is also no insight as to the duration of those “NO PARKING” zones. Please be advised that the National Hurricane Center is predicting heavy rain and wind as part of Hurricane Florence. Due to the likelihood of flooding, the Office of Emergency Management is taking precautions by putting no parking signs and barricades near flood prone intersections. The Atlantic Storm season is certainly ramping up. 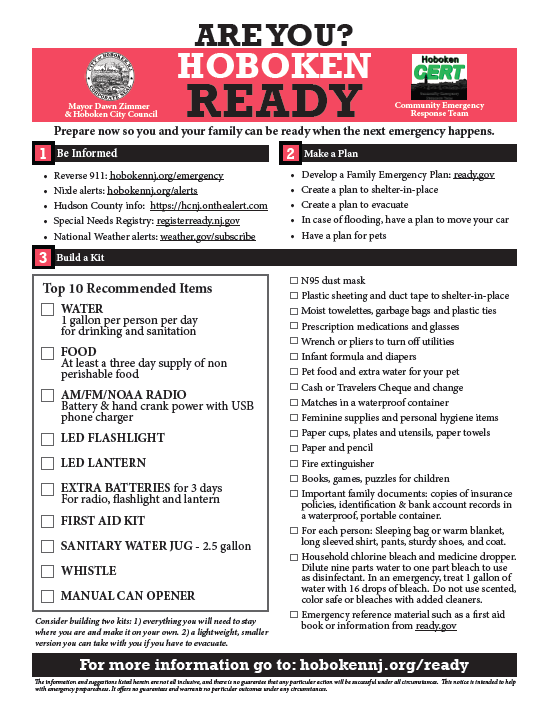 So be proactive—take the time NOW to prepare for adverse weather conditions here in Hoboken. We’ve all seen the empty store shelves, price gouging on water and lines at the gas stations down South. You can avoid all of that anxiety by making a plan, stocking up on supplies and being ready for whatever Mother Nature may or may not have in store for us in the days/weeks/months to come.